The #Spring10x10 might be long done but the good vibes have kept me going all week! I had such a wonderful time hosting this round of the 10×10 Challenge with my go-to gal Caroline of Un-Fancy and our designer guest-host extraordinaire Liz of Elizabeth Suzann. It is truly an honour to work with such inspiring, smart and genuine women and I can’t thank them enough for joining me! I know I always say how incredible the #10x10Friends community is but, honestly, it always blows me away to see so many kind, thoughtful and stylish folks coming together each season. I love how diverse the feeds are getting and just how many people are interested in the topic of conscious consumption. We are making waves and I can truly feel the mindset shifting. Thank you all so much for being part of that! I took a few days to let this session sink in and gave myself some time to regroup after an intense 10 days of social media immersion. 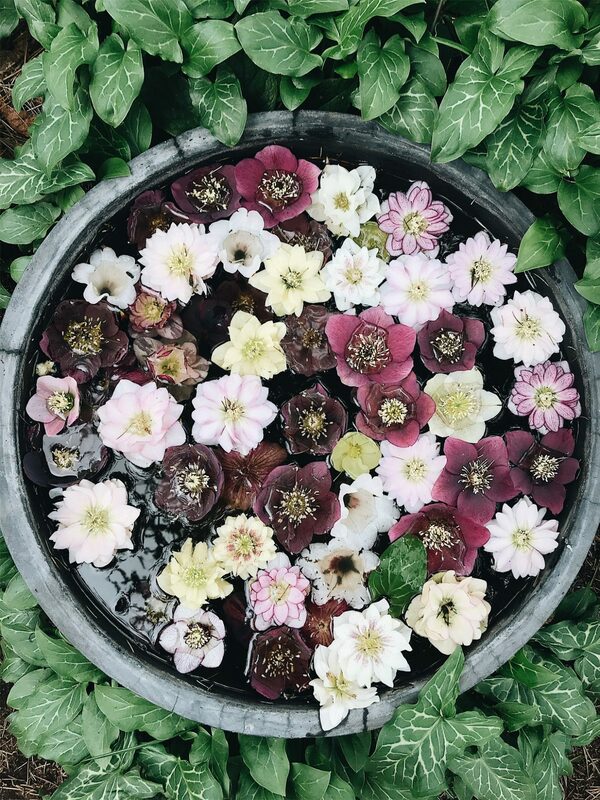 I tip my hat to the influencers who manage to be posting and story-ing everyday, it’s definitely a full-time job! But now it’s time to recap the Spring 10×10 before we dig into lots of fun new topics this month. A quick refresher of my 10 items. My 5 favourite themes throughout the #Spring10x10 community. 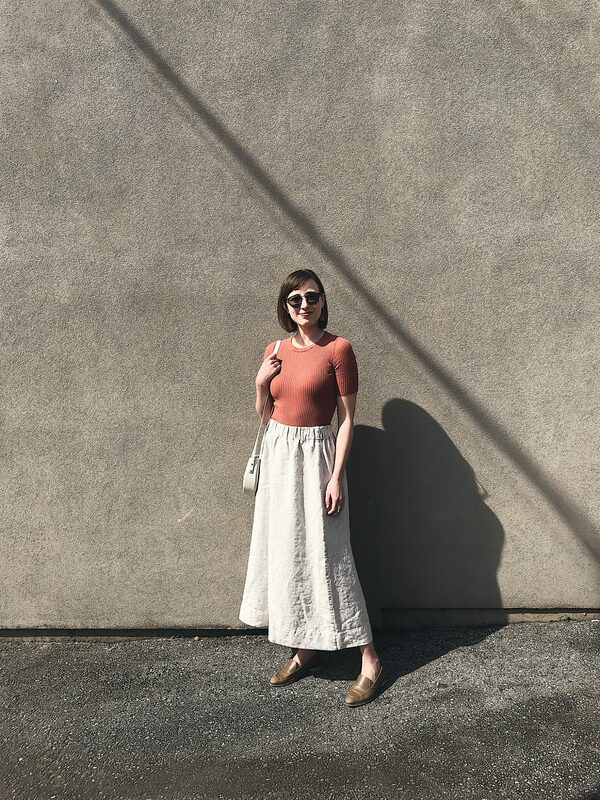 1 | BEL SKIRT in FLAX LINEN | Elizabeth Suzann | Gifted | I wear a S Reg in this piece and it’s very roomy. | $205 USD | Made responsibly in Nashville, TN. 3 | CALLY BOOT | COCLICO | Gifted | $435 USD | I wear a US 7 and the 37.5 is snug but fits. I would recommend going a full size up ie: US7 = 38 | Made responsibly in Spain. 4 | CLYDE JACKET in BLACK LINEN | Elizabeth Suzann | Gifted | I wear a S in this piece. | $245 USD | Made responsibly in Nashville, TN. 5 | FLORENCE PANT in IVORY LINEN | Elizabeth Suzann | Bought by me | I wear the S Reg in these but this is the old inseam length which is a tad longer. | $195 USD | Made responsibly in Nashville, TN. 7 | MODERN BOYFRIEND DENIM | Everlane | Gifted | I have a 27 in these but had them tailored a fair amount to fit how I wanted. I would get a 26 if ordering again. | Made responsibly in Vietnam. 8 | LINN TEE in IVORY SILK | Elizabeth Suzann | Bought by me | I wear an OSM in this piece. | $175 USD | Made responsibly in Nashville, TN. 9 | MODERN LOAFER in OLIVE | Everlane | Bought by me | I wear a 7 and they run narrow to I had the toe stretched out. Order 1/2 size up. | $168 USD | Made responsibly in Italy. 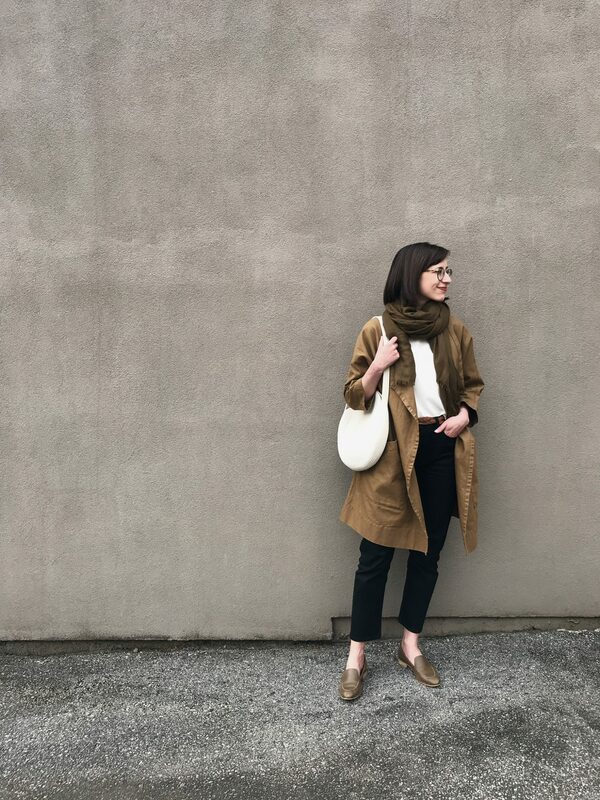 10 | CASHMERE CROP MOCK NECK | Everlane | Bought by me | I wear a S in this style or M if I plan to layer. | $100 USD | Made responsibly in China. You can see all 10 looks along with all the details and videos in my Instagram Story Highlights. Similar to the Winter 10×10 Recap I’m going to approach this review as a whole instead of focusing on specific outfit styling details. Not that I don’t love discussing the nitty-gritty but I’m more interested in the overall this time around. So here’s a little Q&A with me, myself and I. 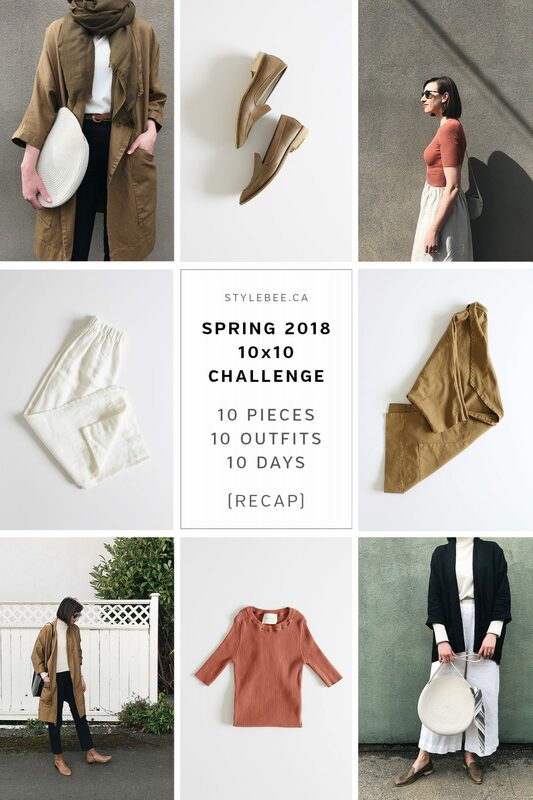 1 | WHAT WERE YOUR #SPRING10X10 CHALLENGE GOALs? Allllmost! It may not seem like a lot of colour when you look at the items or outfits as a whole but it there was definitely enough colour in the mix to shake up my comfort zone. I loved wearing the rust/rose bodysuit and noticed how it made all my neutrals feel instantly more energized, but at the same time I was on the edge. It’s not that I don’t think colour can be chic and sophisticated it’s that it feels very playful, which is not an adjective I’m used to using when it comes to my style. I learned that I was feeling like I should embrace colour more because I like it on other people but in reality neutrals and earth tones are what I feel most myself in. I did! Despite the nasty rain spell that started in the latter half of the challenge I managed to get out and about a lot. I visited VanDusen Gardens (my new obsession) with the talented Gillian Stevens (who took the first photo in this post), ventured downtown for a talk on The Perils of Fast Fashion with my pal Elim Chu, explored Kitsilano’s cherry blossoms, zipped over to Victoria for a family visit, took Dobby way up into the Pacific Spirit Trails and UBC plus, there were lots of café visits and dinners in between. It felt like a really full and invigorating 10+ days! I also discovered that for me, one of the hurdles to actually leaving the house most days is getting dressed. Having to get ready and take an outfit photo was an excellent motivator and catalyst to doing other things. Knowing what I was going to wear made the process that much more effective too! 2 | WHAT DID YOU LEARN ABOUT PERSONAL STYLE? That it’s good to step outside my comfort zone now and again. Even if it just reaffirms what I feel best in, it’s fun and worthwhile to experiment a little. Just one piece in a new-to-me colour added so much to my closet and options overall. Fabric is paramount to whether or not I’ll wear something a lot. 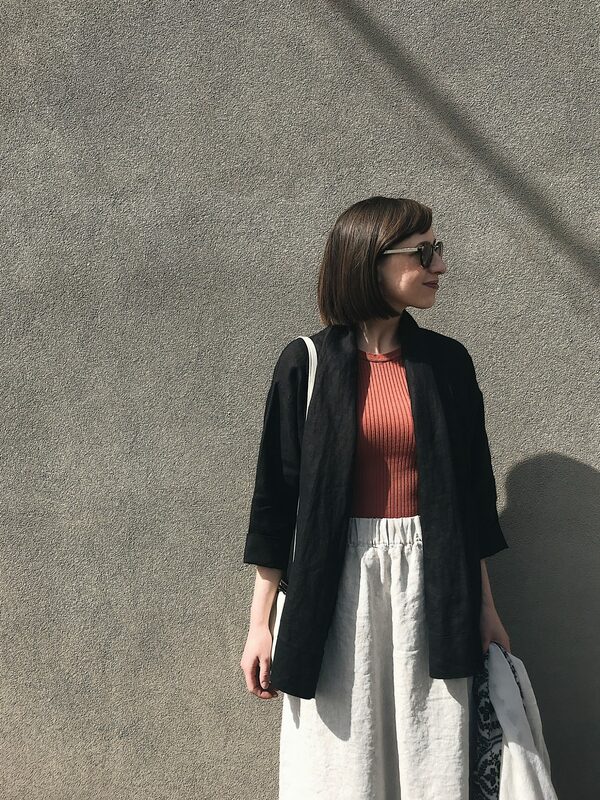 I love silk so much but the Bel Skirt in linen will have way more longevity in my closet than the Moss Silk because it’s a more forgiving fabric. 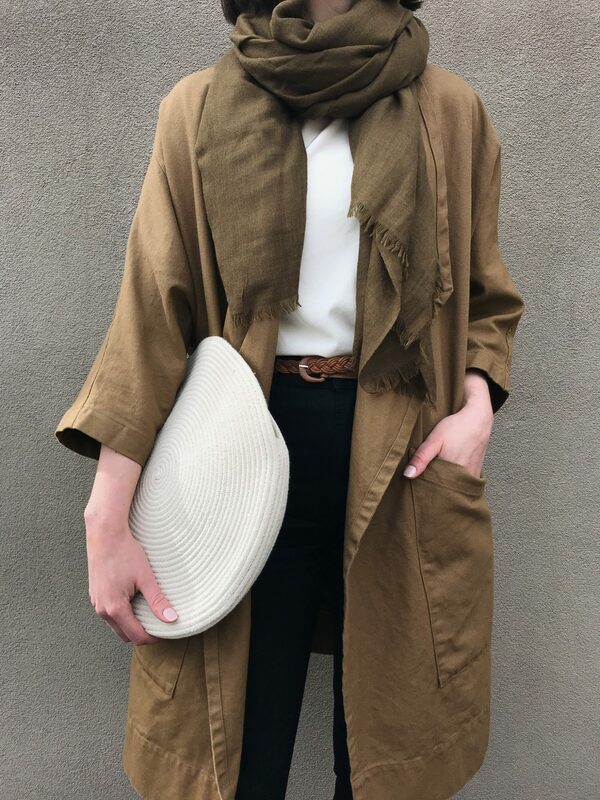 Scarves are the real 10×10 heroes! They’re so key for transitional weather and for polishing off an outfit. I ended up wearing a scarf in one way or another almost every singe day. 3 | WHAT WAS YOUR 10×10 MVP? It’s hard to say for sure because I felt like each item held its own but I think the MVP was probably my Harper Jacket. It just made for such a fabulous statement over any simple base. I always felt elegant and sophisticated wearing it and love how it looks belted. It was a little light for the particularly cold and windy evenings but with a scarf and a long sleeve underneath I was good. 4 | WERE THERE ANY PIECES YOU WOULD CONSIDER A MISTAKE? No regrets here but hindsight is always 20/20 right? This was the first time I’d included two jackets of a similar weight and it definitely made it harder to come up with 10 unique outfits since I had to wear all three tops a minimum of three times each. I might have exchanged one jacket for a sweater dress or a tunic sweater. 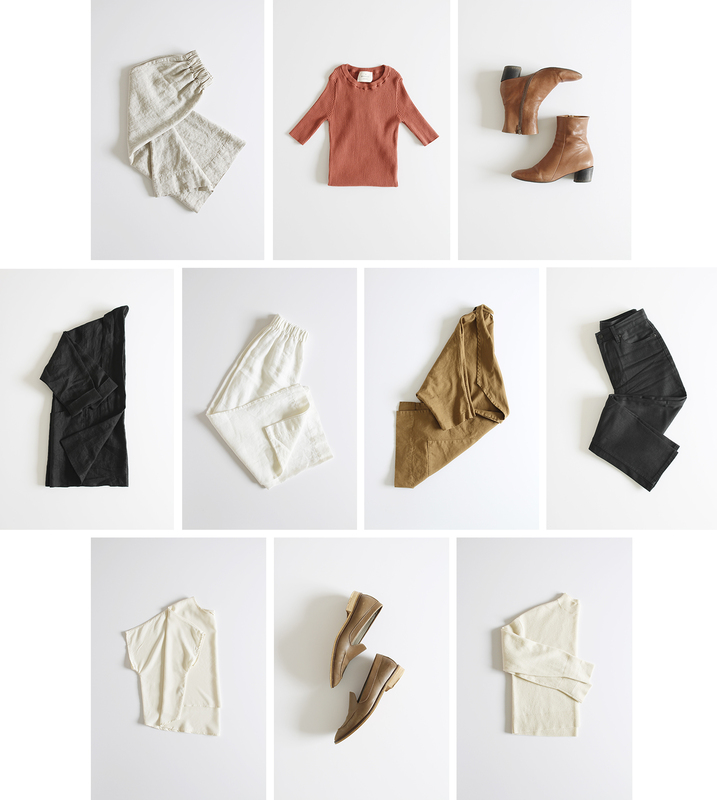 5 | WERE YOUR ITEMS WEATHER APPROPRIATE? For the most part yes but for some of it not so much. The weather for two-thirds of the challenge was fairly warm and sunny but then it got cold, gross and rainy. My poor boots took a real beating in the wet weather but I’m hoping I can restore them back to their original glory. 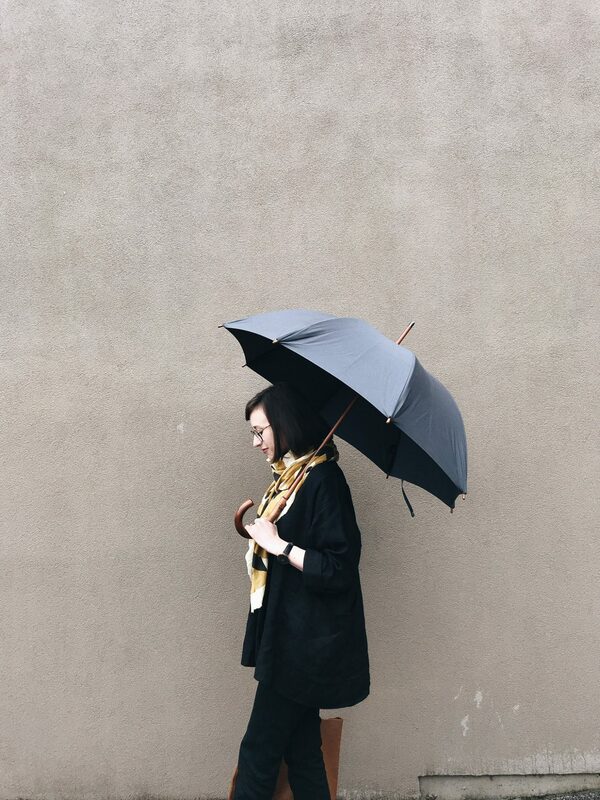 My umbrella, however, was basically my best friend on those rough days and didn’t miss a beat. It would have been good to have another warm base layer in the mix, maybe instead of my Linn tee but it’s so hard to know how the forecast will really shape up out here so I feel pretty good about how I was able to manage. 6 | WHICH OUTFIT WAS YOUR FAVOURITE? Ok this one is a tie. 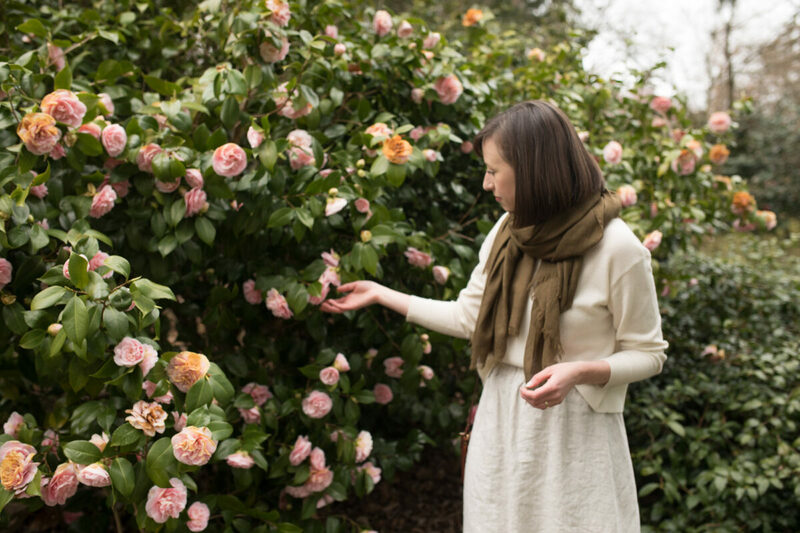 I LOVED wearing my Bodysuit and Bel Skirt together (Look 2, photo below) because it felt fresh, feminine, flirty and perfect for a Spring evening spent exploring the cherry blossoms with two of my favourite people. But I also LOVED Look 5 (photo below) because it had a dreamy, earthy palette and was oh so easy to wear any day and anywhere. It’s funny because those two are probably the furthest apart on the spectrum but yet, both such a pleasure to wear. I was also really excited with how Look 10 (photo below) worked out. I’d jokingly tried belting the Harper Jacket but then it looked so good I decided to wear it for real. It wasn’t terribly functional though because I could barely lift my arms and the belt was a bit uncomfortable over all that canvas material. Glad I gave it a go though! 7 | WHAT ITEMS DIDN’T GET PAIRED? I managed to pair up allllmost every single item except my Harper Jacket and Bel Skirt. I don’t love how those look together because I find the volume of the skirt is best balanced by a shorter jacket and a more fitted top. 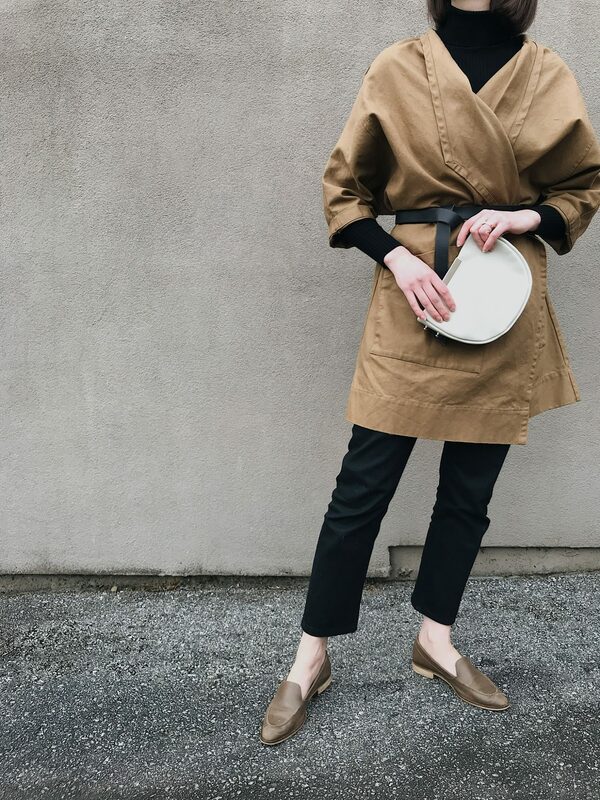 Wearing both of those oversize items together feels like a lot of loose-fitting material at one time. 8 | HOW DOES THE CLYDE JACKET COMPARE TO THE CARDIFF WORK JACKET? This question started coming up before I’d even shared my 10 items so I kept it in mind throughout the 10×10. The truth is that the Clyde Jacket by Elizabeth Suzann and the Cardiff Work Jacket by Only Child are quite similar and you really can’t go wrong with either option. I have the Clyde in Linen and the Cardiff in both Wool and an old canvas version so I cannot comment on the difference in linens, however, there are some key design details that make these jackets different. So here they are! SLEEVES: The Cardiff sleeves are 5 inches longer than the Clyde sleeves and come past my wrists when left unrolled, however I love them rolled and always wear them that way. The Clyde sleeves are slightly cropped on my arms and also a little bit tapered which I like because they don’t drag through or get caught on things. The cropped length also makes styling a breeze because any long sleeve worn underneath will peek out automatically. FIT: Both jackets are fairly oversized in fit (which I love) but the Clyde Jacket definitely feels more voluminous overall. Both are very forgiving in terms of sizing and you can really wrap yourself up in either. Because of the additional width on the Clyde it feels as though it’s longer but they’re just about the same length and hit a couple of inches down the thigh. COLLAR: The Clyde Jacket has a much wider front panel, which gives it that beautiful draped collar and results in a slimmer opening in the front. The Cardiff has a narrower front panel and therefor slimmer collar but a wider open front. Both give you the option of wearing it up or down. POCKETS: The Cardiff pockets are cut straight and angled down at the back while the Clyde pockets are curved. Both are quite deep and span the side of the jacket in a flattering way. The Clyde pocket is made of three layers of fabric as it’s an interior pocket, whereas the Cardiff pocket is just two layers of material since it’s sewn right on top of the coat. This results in a little added volume on the Clyde. They both come in cotton canvas and linen and lots of colours options. The Clyde Jacket is $245 USD and the Cardiff Work Jacket is $225 USD. I’d say if you want a slimmer fit go for the Cardiff but if you want a more full and floaty jacket go for the Clyde. I honestly love both! 9 | WHAT WAS THE HARDEST PART ABOUT THIS 10×10? There were a couple of tricky elements with this 10×10 for me. One was not having a studio to shoot in ahead of time or a place to film my daily stories. I found myself feeling pretty stressed about getting my outfit photos done everyday. But I managed and it was a good reminder that it takes some serious commitment to document all 10 days as thoroughly as I like to. Another was the sheer scale to which this community has grown. Which is AWESOME don’t get me wrong, but it’s also really hard to keep up with everyone and I’ve always done my best to make every participant feel acknowledged and appreciated. With thousands of new posts up every day it was impossible to connect with everyone personally so I felt a bit guilty that I couldn’t. The good thing is that everyone is so supportive and welcoming which made my job a lot easier! 10 | WHAT WAS YOUR FAVOURITE PART OF THE CHALLENGE? Usually I’d say that it was seeing how the 10×10 community came together yet again, to support, encourage and engage with each other in such a positive way but this time around I’ve got to give it to my boys. 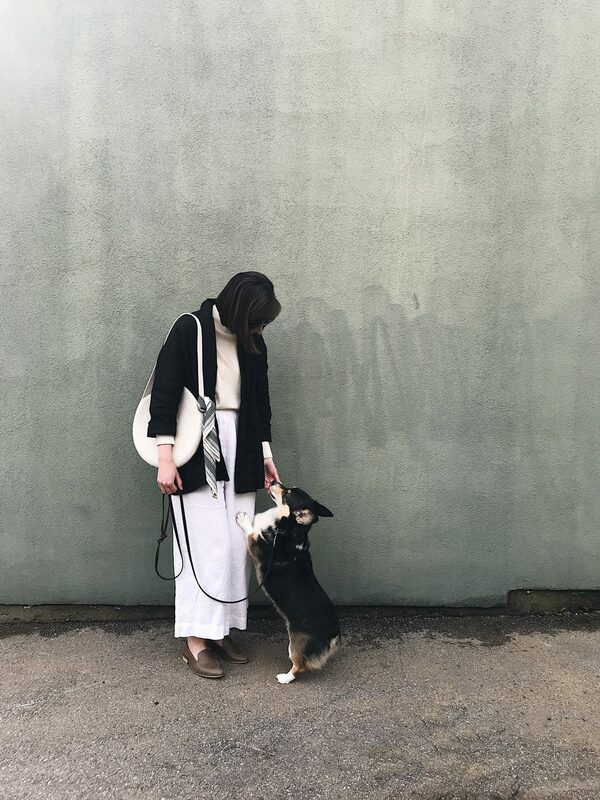 Each day after work, Dave and I would take Dobby for a walk and find a wall to shoot my outfit against. It was so nice to spend this time with them and felt really special to include them in the challenge. They were such troopers, even when it was raining and made the whole documentation process much more fun. Now I’m trying to convince Dave to join the 10×10 next time! Plus, we got my favourite photo ever out of the deal. Thanks boys! 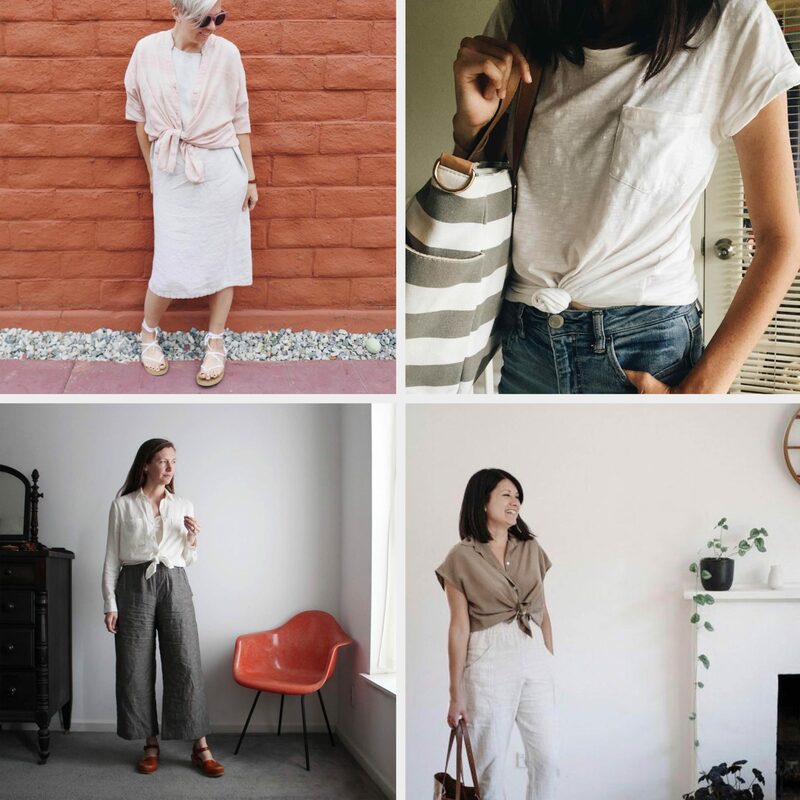 There were lots of recurring themes throughout the feeds this time around and it was so cool to see how everyone approaches seasonal trends within their own personal style. 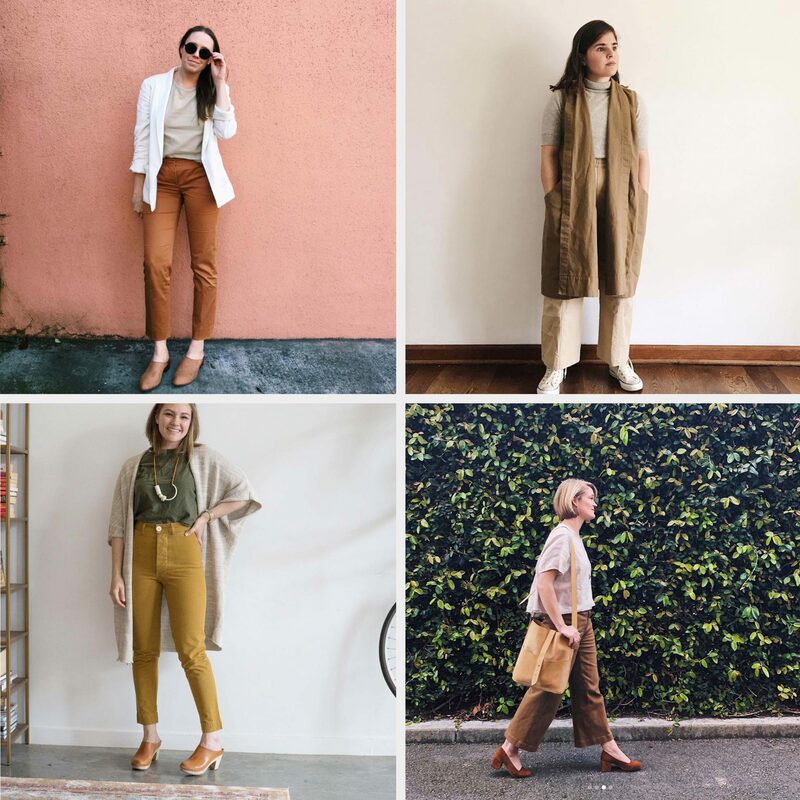 Whether it’s colour palettes, specific items, styling tricks or props everyone makes it their own and there were no two looks completely alike. Out of thousands I think that’s pretty damn awesome! So here are a few of my favourite style themes throughout the Spring 10×10. I love how warm, earthy, rich tones are finding their way into so many spring closets! 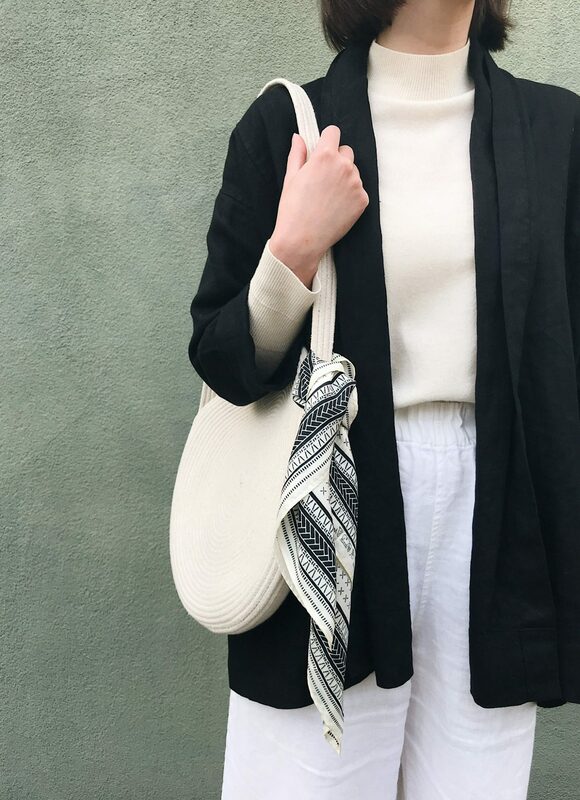 I love saturated neutrals all year even though they’ve often been relegated to Fall and Winter. I was inspired by how well they all work together too. Cognac and Tan, Clay and Khaki, Olive and Mustard, Camel and Caramel, okay now I’m getting hungry. Great work folks! I loved how many times I read, “I would have never tried this combo but I love it!” when it came to trying a dress over pants. It’s something I haven’t tried since the Fall but I’ve been inspired to try it again this spring. I particularly love how the long shirt dress and long shift dress work over a simple black pant. Thanks for the inspiration y’all! It was lovely to see so many fresh, fun, full skirts twirling around the hashtags! 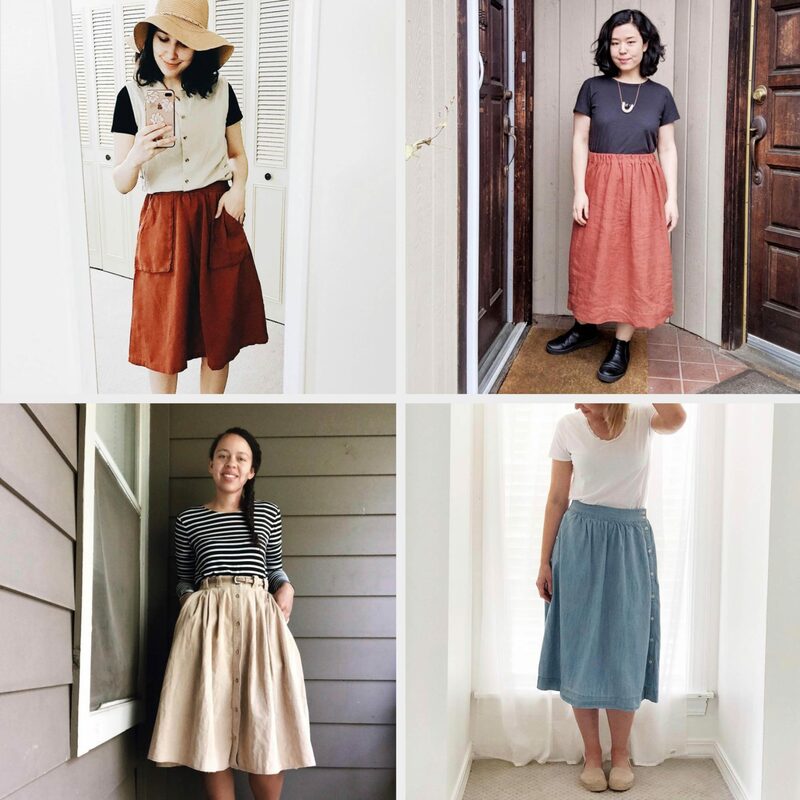 A midi skirt was definitely outside my personal style comfort zone (which is pants, pants and more pants) so I gained a lot of confidence and ideas by seeing other people rocking theirs so well. Merci beaucoup! 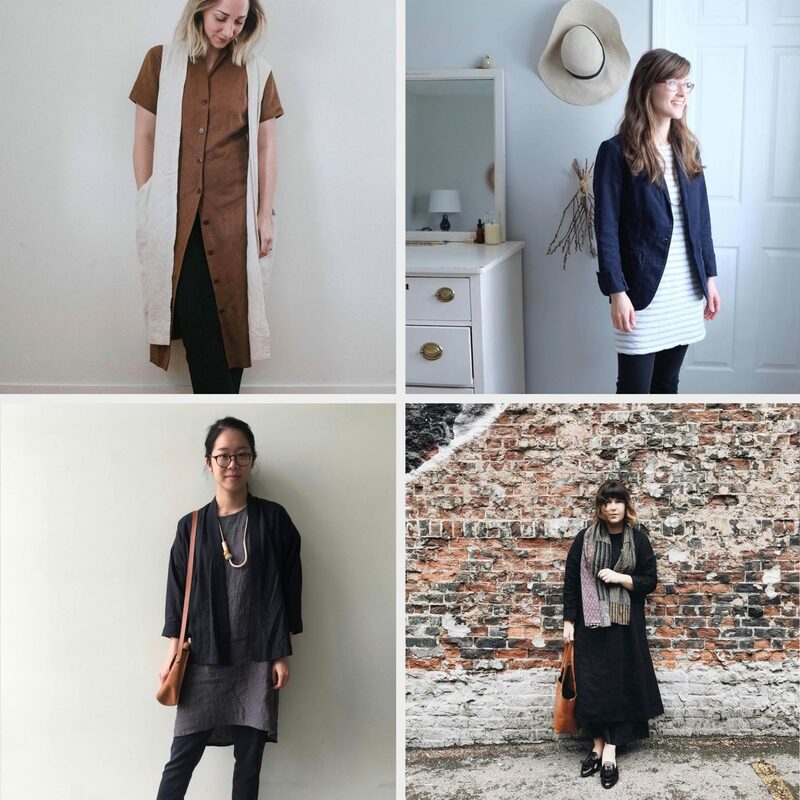 I’ve got to say that our #10x10Friends are getting more and more creative when it comes to styling pieces. I was so impressed with how many different types of knotted tops were cropping up everywhere (pun intended!). A loose loop over a dress, a centred little knot on a basic tee, unbuttoned and tied over a tank and of course a cute silk shirt tied just right! Keep those ideas coming for next time friends! Of course, this one was my favourite! 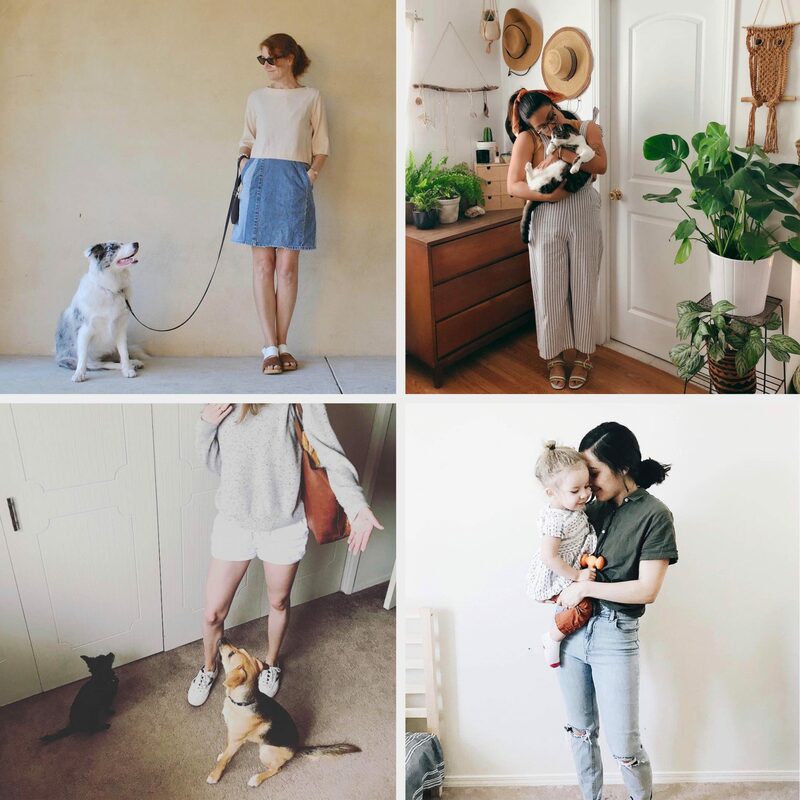 It’s so fun to get a peek into all the challenge participants lives and seeing their fur friends, plant pals and tiny humans makes it feel so much more real and genuine. Not to mention that they often make taking an awkward self-portrait a lot less weird! I’m sure they’re glad we’re done for this round too! First up, how did the latest challenge go? Was it as easy/hard, fun/annoying as you thought it would be? Did you make it through? What was your biggest takeaway? How did you feel about us having a designer guest host? What would you love to see in future 10×10 Challenges? Activewear, vacation packing, a men’s 10×10, let me know! Finally, if you haven’t joined a 10×10 yet, what’s stopping you? I’d love to explore ways to make it feel even more accessible. THANKS FOR JOINING IN AND IF YOU MISSED THIS ONE, NO WORRIES! WE’LL BE BACK AGAIN THIS SUMMER! Thanks so much for hosting again Lee! I so love to see all the outfits and positive energy with every 10×10 challenge. I personally thought it was great including Elizabeth in the challenge. However, it did seem to add an element of confusion or guilt, even, for some people who wanted to participate and didn’t have any ES pieces. I know that it wasn’t the intention at all to limit the challenge to include ES pieces, but I can see where people might have gotten that impression. I don’t know how to get around that, but I guess it’s something to consider for the future. Anyway, it was a lot of fun to see everyone’s outfits. The community is great. Thanks for doing it! This was my first 10×10 so I played it pretty safe. The weather did not cooperate as it was -18 so I swapped out an item for a heavy sweater. 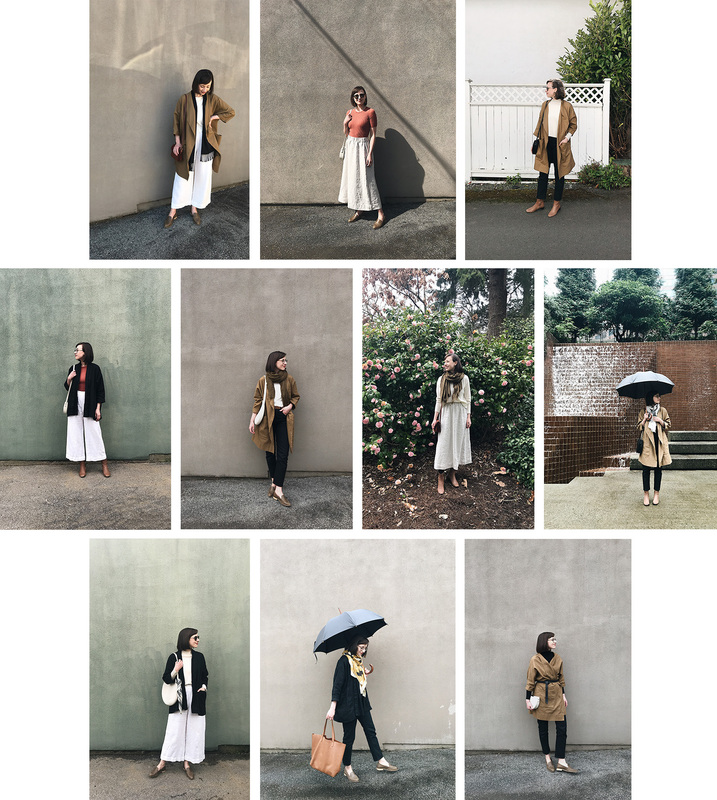 I think next time I’d try to find a better way/place to document the full outfits. One of the biggest challenges for me is my work wardrobe and weekend wardrobe are pretty separate as I have small children. My favourite part was definitely the community and the hope of winning one of the ES gift certificates (probably why I finally joined in, love the designer guest host). For future challenges it might be nice to have it a little later in the season. Thank you for the mention! I really loved this challenge, and I’m not sure what clicked for me, but it just felt so successful. I am all heart eyes for you guys (and that Eliz Suzann!) ? What kind of tailoring did you have done to the Everlane jeans? Just taking them in at the waist, or more adjustments? I love the rise on them but the leg isn’t as straight fitting as I’d like. Wondering if I should size up and take in at the waist. Thanks! I totally loved watching this 10×10. I like your ten items and think you look great in all your photos, you’re right the last photo of you three is the best! Like some of the other posts I haven’t participated in a 10×10 yet, I’ve followed the last three and I think it’s a brilliant project. So I should join in next time! One thing is that I’m in Australia and therefore have opposite weather/seasons, so I should look back at this 10×10 in September I guess. Maybe we need a #southernhemisphere sub-group, ha ha. I really enjoyed having the guest host join in, it was fun to follow how ES went with the challenge. I think holiday packing and activewear would be good topics to see in the future. I think it would also be interesting to explore the use of colour, I like wearing colourful clothes but find it hard to balance sometimes. I think you looked great in the rose colour by the way! Also want to let you know I love these black boyfriend jeans and am now planning to get some. I also bought my first ever bodysuit thanks to your posts, and it’s great! So many thanks for all you do, it’s really appreciated and makes me enjoy my clothes and thinking about them in a positive way! I loved how you included EZ this time around. That was a brilliant idea! Re next time, I think it would be fun base it on vacation packing! That is always needed:) Thanks again! I’m still yet to embark on my own 10×10 challenge for some reason. I love seeing other people’s creativity but am always scared of being restricted! Crazy since I’ll get back to the wardrobe after not too long, I just need to take the plunge. But! I’ve decided to put together my own intro to a 10×10, as it were, since my partner and I will be moving to Finland for 3 months (excited + nervous all at once!?). As I’ll only be taking a suitcase worth of clothes (and, lets be honest, can probably jam some things into my partners case as well..), is there a formula or ratio of items you would recommend? It seems I always overpack, so I was thinking maybe 30-50 items (including shoes) would be a good ballpark.. I found that it wasn’t so difficult to create outfits I liked, this was my first 10×10 and I was pleasantly surprised at the ease of that element of it. The most difficult part was documenting it as I don’t have a full-length mirror (hopefully by the next one) and I did have to cheat a bit near the end because I had only chosen extremely light-hued items in terms of bottoms and I began my period halfway through…lol. So although I had come up with the outfits without issue, I couldn’t really wear them all day as I have a rather heavy period. Definitely something to consider for the next 10×10. Your favorite picture is really cute. 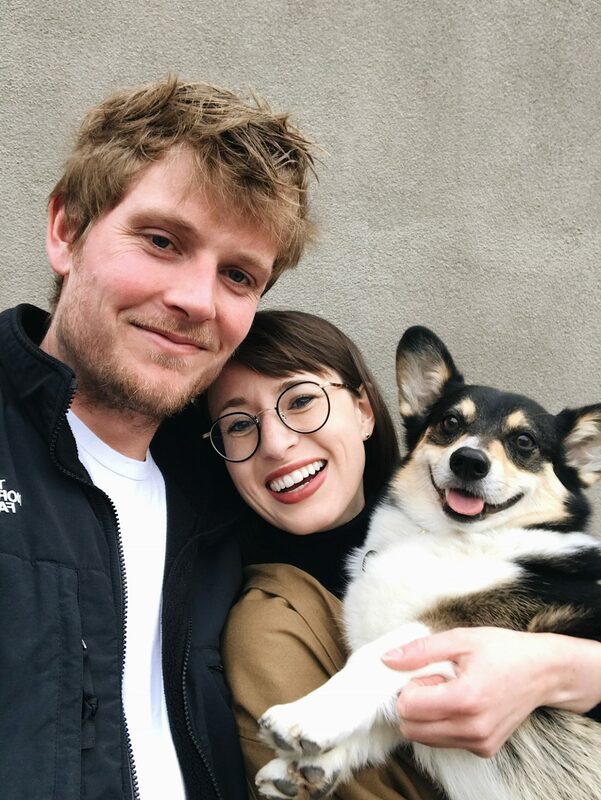 I love corgis – whenever I see one they are so darn happy to see me – and they’ve never met me before! Great for the ego! The bodysuit color is great – it’s a pretty, earthy tone. Someday I’ll participate but I always get great ideas from following everyone. Love this recap! I wasn’t able to participate but loved watching the community come together! Such a joy to see it grow so tremendously! Once again the 10×10 coincided with a show I was in, so i didn’t participate due to the fact that i generally show up at the theater in PJ’s and get my costume on right away. One of these days I’ll join in. ?